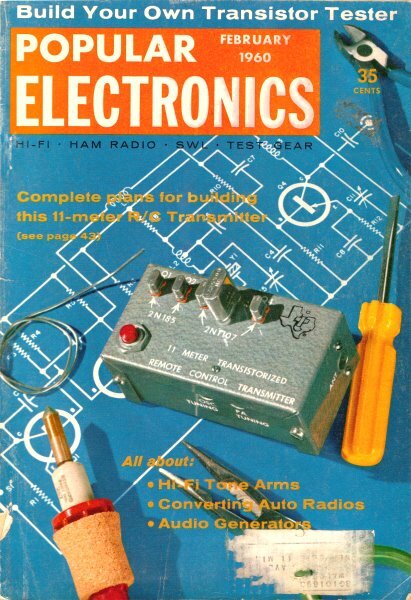 Transistor Topics was a monthly column that helped introduce and educate readers to the relatively new topic of transistor design and troubleshooting. The editor often presented questions from readers and answered in layman's terms. This month's question came from a reader in Bogota, Columbia, which in 1960, was a big deal. Nowadays we take for granted how small the world is due to the Internet. It's hard to believe, but the transistor's high efficiency and extended life span have turned out to be "too much of a good thing" in one respect. The transistorized, solar-battery powered transmitters used in artificial satellites can continue to broadcast their data for years - which is fine, up to a point. But as more and more artificial satellites and space probe rockets are launched, the airways will soon become cluttered with an overwhelming number of transmissions. Since there is a limited amount of space in the radio spectrum, new satellites may find their broadcasting being interfered with by signals sent out by satellites launched years earlier. To prevent this unhappy situation from occurring, the Army Ballistic Missile Agency has had the Bulova Watch Company design a special "silencer" to turn off solar-powered transmitters. Assembled in a cube measuring about two inches on each side, this interesting device weighs about two and one-half pounds. Fully transistorized itself, it develops approximately one-billionth of one horse­power, yet can be set to switch off a transmitter automatically after an interval of from zero to nine thousand hours. Looking to the future, we can envision larger artificial satellites spaced in regular orbits around the sun, to be used as outer-space "mileposts" or marker beacons by interplanetary cargo and passenger ships. Their transistorized transmitters would be powered either by giant banks of solar batteries or by nuclear "fuel cells" to insure adequate output power. Reader's Circuit. Our mailbag frequently includes letters from POP'tronics readers in South America, Europe, and Africa; and we've even received mail from as far away as India. Interestingly enough, many of these readers are experimenting with circuits-and using components ­ just like those popular with stateside hobbyists. The circuit in Fig. 1 was submitted by Alexis Pertuz, a high school student in Bogota, Colombia. Alexis' circuit is that of a five-transistor AM broadcast-band receiver, with U.S.-distributed components being used throughout. Essentially a t.r.f. design, it includes a doubler-type diode detector and a three-stage audio amplifier. A class AB push-pull output stage is employed, and p-n-p transistors in the common-emitter arrangement are used in all stages. In operation, r.f. signals are picked up and selected by tuned circuit L1-C1. A tap on L1 matches the high impedance of the tuned circuit to the moderate input imped­ance of the r.f. amplifier Q1, assuring minimum tuned circuit loading and thus maximum circuit "Q" and selectivity. Transistor Q1's base bias is furnished through R1, bypassed by C2, in conjunction with emitter resistor R2, bypassed by C3. A small r.f. choke, L2, serves as Q1's collector load, with the amplified r.f. signal appearing across this coil coupled through C5 to the doubler-type diode detector D1-D2. The r.f. gain is controlled by bypass capacitor C4 and series resistor R3. Fig. 1. Five-transistor AM broadcast-band receiver circuit submitted by reader Alexis Pertuz, of Bogota, Colombia, includes doubler­type diode detector and a three-stage audio amplifier. From the detector, the resulting audio signal is amplified by a two-stage resistance-capacity-coupled audio amplifier, Q2 - Q3. Potentiometer R6 serves as an audio gain control. Large-value electrolytic capacitors, C7 and C8, are used for interstage coupling to prevent attenuation of low-frequency signals. The second audio amplifier stage, Q3, is transformer-coupled to the class AB push­pull output stage (Q4, Q5) through T1. 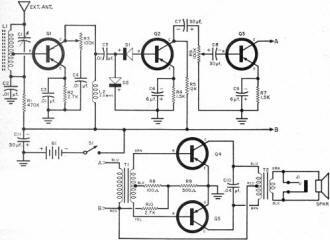 Output stage bias is furnished by voltage divider R9-R10 and series base resistor R8. The push-pull stage, in turn, is coupled to its PM loudspeaker load through impedance-matching output transformer T2. A small open-circuit jack (J1), across the speaker, is provided for earphone operation. The d.c. power is furnished by a 6-volt power pack, B1, controlled by a s.p.s.t. on-off switch, S1, and bypassed by C11. You can duplicate the receiver using readily available components. Coil L1 is a standard ferrite loopstick (Lafayette MS-330) and C1 is a small 365-µµf. variable capacitor. L2 is a common 2.5-mh. choke. All electrolytic capacitors should have a minimum working voltage of 15 volts. In the output stage, T1 is an Argonne Type AR-175, with a Type AR-119 being used for T2. 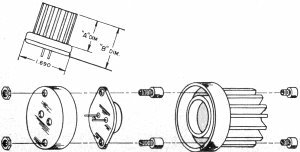 Any standard PM loudspeaker may be employed-a small unit (2" to 4") for pocket-sized sets, a larger unit (4" to 8") for better tone quality. 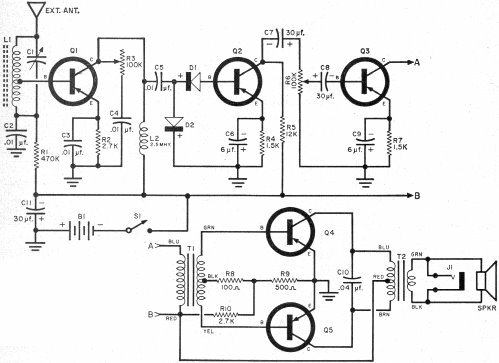 Transistor Q1 is an RCA Type 2N147 "drift" type, Q2 and Q3 are G.E. 2N107's and Q4 and Q5 are RCA 2N109's. Almost any crystal diodes can be used for D1 and D2; Alexis used 1N48's, but 1N34's or 1N34A's should work as well. Transistorized TV tuner, now available from General Instrument Corp., is much smaller and lighter in weight than old-style tube­operated tuner. Voltage reference packs made by International Rectifier come in miniature sizes for printed-circuit board installation and larger sizes for conventional mounting. Fig. 2. Outline sketch and mounting details of transistor heat dissipator recently introduced by the International Electronic Research Corporation. The power pack is made up of four pen­light cells connected in series to furnish six volts. However, Alexis indicates that the receiver will work satisfactorily on a 9-volt battery without circuit changes. Neither circuit layout nor lead dress should be especially critical, although the usual care should be taken to keep signal leads short and direct. The receiver is suited to either "chassis-type" or "circuit board" construction, depending on individual preferences. Reference Packs. "Pre-packaged" assemblies using semiconductor components are becoming increasingly popular for many circuit applications. 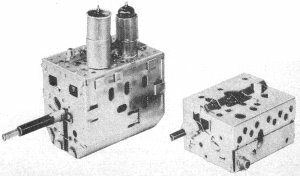 Typical units are the voltage reference packs manufactured by the International Rectifier Corporation (1521 E. Grand Ave., El Segundo, Calif.) . These are made in sizes ranging from miniature units designed for circuit board mounting and providing a single output voltage to larger units which can operate from a.c. or d.c. sources and can supply two or more regulated outputs. Voltage reference packs, in general, supply a known accurately controlled d.c. output voltage which is maintained constant regardless of variations in ambient temperatures or in input supply voltages. They are used to replace standard cells or dry cell batteries in such equipment as digital voltmeters, regulated power supplies, potentiometric recording instruments, fire control systems, autopilots, missile guidance control gear, and aircraft instrumentation and communication equipment. Heat Dissipators. Excessive heat can destroy a transistor. Even a moderately high temperature can bring about a deterioration in overall circuit performance. Often, the problem is not so much that of high ambient temperature as that of getting rid of heat developed within the transistor itself. High power transistors used near their maximum ratings can become quite warm. To help dissipate internally developed heat in semiconductor devices, the International Electronic Research Corporation (145 West Magnolia Blvd., Burbank, Calif.) has introduced a line of especially designed heat dissipators. These units are made in a variety of styles to match the most popular transistors and power diodes. They are available through regular parts distributors and, in quantity, direct from the manufacturer. A typical IERC heat dissipator, designed for use with transistors in the familiar JETEC TO-3 "diamond" package, is illustrated in outline form in Fig. 2. Overseas News. Semiconductor devices are being used in larger and larger quantities in the design of foreign-made products. Here are a few spot items received from our overseas sources. Nippon Audio Kogyo Co., Ltd., Tokyo, Japan, is manufacturing transistorized telephones; each set is designed as an automatic dial master phone and may call any of ten stations. And Toho Electronics, also in Japan, has introduced a fully transistorized wirephoto transmitter. There are several items from Germany. Dr. med. Noeller, Children's Hospital, Heidelberg University, has designed a sub­miniature transistorized transmitter which, with its self-contained battery, measures only 5/32" 1/4" over-all; it is swallowed by the patient and transmits data on pressure, temperature, and the pH value within the stomach or intestinal system. Grundig Radio-Werke GmbH, Fuerth/Bay, is producing a miniature transistorized tape recorder. And a Hamburg firm, Protona GmbH, has introduced a fully transistorized FM walkie-talkie weighing only 25 ounces. The Metropolitan Water Board, Sydney, Australia, is using a transistorized indicator system for low-level sewage pumping stations. In Leningrad, Russia, the Aerophysical Institute has reported the development of a semiconductor thermometer which determines the optimum planting time for wheat and corn. Product News. Aldens, a Chicago mail order house, is advertising a 3-band, 7-transistor portable receiver which sells complete with battery and leather carrying case for only $49.95. The set tunes the AM broadcast band from 540 to 1600 kc. and short-wave bands from 3.5 to 12 mc. Motorola, Inc. has announced price cuts in its line of Zener diodes. 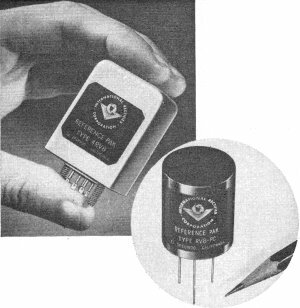 There is also news of price cuts on power transistors made by Delco Radio. The General Instrument Corporation, (Chicopee, Mass.) has started large-scale manufacture of fully transistorized TV tuners. These units use three Philco micro­alloy diffused transistors (MADT) and offer a performance comparable to that obtained from vacuum-tube operated tuners with respect to gain, signal-to-noise ratio, and image and i.f. rejection. Designed for operation on 12 volts, these tuners require only 8.5 ma. current. Before too long, the Raytheon Manufac­turing Company, pioneer manufacturer of low-cost "experimenter's transistors," is expected to announce two new types-p-n-p units selling for under 90¢ each to the user. That does it. See you next month.